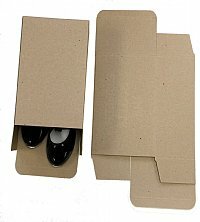 Reverse tuck carton design (just like the Scotty Stuffer) makes these shoes boxes easy to use. Just pop open the box and tuck in the end flaps. Heavy duty construction for extra protection and stackability. Flat and compact design means no more clunky bundles to carry and store. 13" x 8" x 5"
15-1/2" x 11" x 5"